VITECH-TC stands for innovative and outstanding paper cutting knives and related knife manufacturing technology. The special grade of Tungsten Carbide used in VITECH-TC knives is NOT brazed as conventional carbide knives. Instead, Kanefusa's technology uses a proprietary chemical bonding of the inlay to the knife body which eliminates internal stress commonly caused by "brazing". The #1 reoccurring issue with conventional "brazed" in tungsten carbide is edge bow and flat bow. Both types of knife bow have a direct result on the performance of cut. 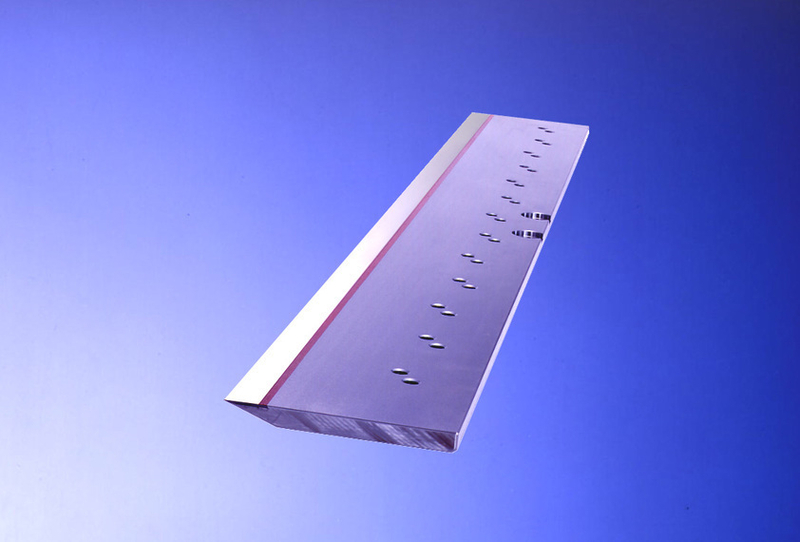 Simply put, the flatter the knife, the higher the performance and yield. Conventionally, Tungsten Carbide is brazed to a steel substrate (knife body). The TC as well as the steel are heated up to 800 degrees C during the brazing process. Due to expanding coefficients they expand to different lengths. In the case of a 54.724" (1390mm), long knife such as a Polar 115, the tungsten carbide will be .250" (5.9mm) longer and the steel .468" (11.9mm) longer at 800 degrees C.
After the TC and the steel are joined together, they cool down and shrink. The TC shrinks differently from the knife body causing internal stress. As a result the knife bows both on the edge and flat ways. The internal stress can also damages the TC. Fig. 1 illustrates both standard Tungsten Carbide and steel substrate knife body pieces cut to length prior to affixing together via brazing. Fig. 2 illustrates the coefficient expansion during the brazing process. Notice the illustrated expansion differences between both Tungsten Carbide and the steel substrate knife body. Fig. 3 illustrates the cooled Tungsten Carbide & steel substrate after brazing. 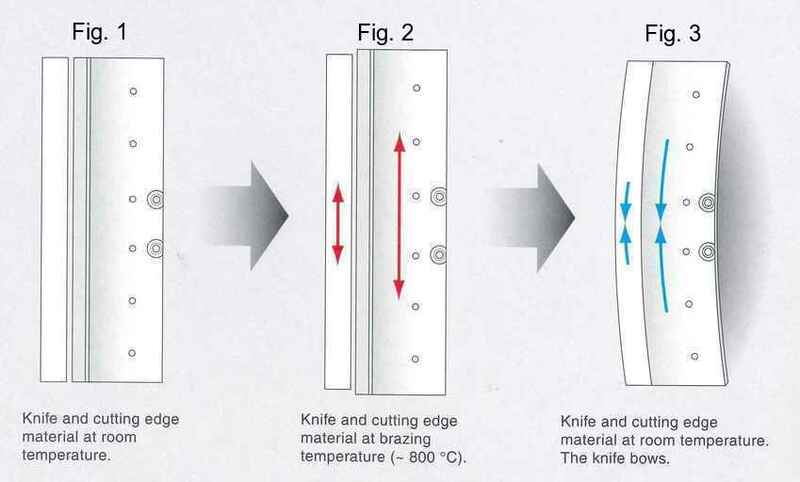 The internal stress of the 2 brazed materials cause the knife to bow both flat & edge ways due to the different metallurgical and hardness properties of each material expanding and contracting.